Happy Hanukkah — happy Thanksgiving. This is the beginning of the holidays, and Christmas is just around the corner. So Berlinica Publishing is offering gifts (sort of): 20 copies of Jews in Berlin, the landmark book about 750 years of Jewish life and history in the German capital, by Andreas Nachama, Julius H. Schoeps, and Hermann Simon, updated in 2013 by Judith Kessler and André Anchuelo, will be for sale. The copies come new from the publisher, sent to you by Amazon.com, for only $18.00 (regularly $23.95). This sale will go on for all of Hanukkah and end in eight days (or, when all books will be sold sold). 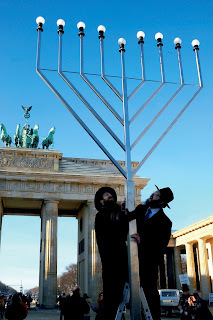 Here is Hanukkah in Berlin (from the book), with the menorah at the Brandenburg Gate. This is an updated edition of Juden in Berlin, published in 2001. All of its multiple authors have personal connections to the city. The book offers well over 100 images – some in full color, including photos, paintings, postcards, and documents. They add immeasurably to its value. Seven chapters review Berlin Jewish history. During the late middle ages, Jews are tolerated, taxed, exploited, murdered, burnt at the stake, and expelled. Despite the ongoing mayhem, a select few Berlin Jews serve as influential physicians and financial advisers. More Jews gain rights in the late 1700s and 1800s. Barriers fall; by World War I, Jews have become German army officers. Astonishing affluence emerges: Twelve of Berlin’s twenty most prosperous individuals in 1911 are Jews or of Jewish heritage. Now Berlin is again a world cultural center, and appealing to Jews: “Since the wall fell in November 1989, Jewish life in Berlin has experienced a veritable quantum leap.” Israelis and Russian Jews are bringing energy to the tiny, damaged Berlin Jewish community. And, as the foreword’s author, Carol Kahn Strauss, points out, Berlin is now a major destination for American Jewish tour groups. Jews loved Berlin – a city that alternately freed and destroyed them. In carefully recounting this confounding tale, Jews in Berlin honors the complexity of an unfathomable relationship. Appendix, bibliography, index. Keep tuned for more sales to come. Next item: A postcard of Bruce Springsteen with a piece of the Berlin Wall.